By Dan Chandler, CISO, and Bob Heckman, CIO, Criterion Systems, Inc. In our first article on the subject of increasing the maturity level of federal department and agency (D&A) cybersecurity and privacy programs (CS&P), we outlined the challenges currently faced by Federal D&As regarding CS&P maturity and proposed a solution: a CS&P Maturity Model that reconciles applicable federal standards and industry best practices. The first step toward increasing maturity is understanding the current state of a CS&P program, project, or system and identifying what the current (as-is) and target (to-be) state looks like. 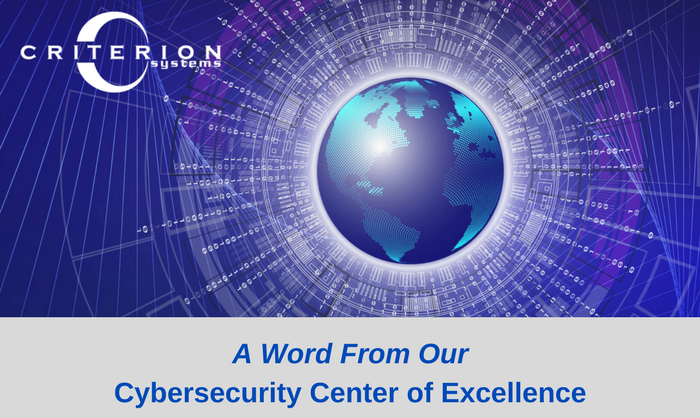 Our solution starts with the NIST Cybersecurity Framework (CSF), and then integrates applicable criteria from FISMA, OMB, DHS, and OIG in order to provide the context needed to measure as-is and to-be CS&P framework profiles. What is a Framework Profile? Starting with the NIST CSF and the organization’s developed profiles, federal D&As then need to combine and resolve several standards, methodologies, procedures, and processes to truly understand their CS&P program’s as-is state. These include FISMA, OMB, DHS, and OIG criteria and annual reporting requirements. Adding to the challenge, current maturity models frequently address only a few of the things Federal D&As need to truly understand where they are at and where they need to go. For example, the OIG currently has developed and implemented criteria that includes incident response, contingency planning, information system continuous monitoring (ISCM), configuration management, etc. DHS’ CyberScope is also non-comprehensive. In order to determine and find the true “As-Is” and “To-Be” CS&P states, all of these elements must be brought together. Recognizing the challenge of combining multiple criteria and requirements, Criterion has created a CS&P maturity model that provides a common language to address and manage CS&P risks. With the problem of taxonomy solved, the model provides a structured method to survey, analyze, document, manage, and enhance an organization’s CS&P program, operations, and /or systems. The model tracks more than 1000 data points, enabling organizations to gain a truly multidimensional view of their program and its needed evolution. This enables Federal D&As to address and manage CS&P risks in a cost-effective way based on mission/business needs without additional regulatory requirements. When building a roadmap, flexibility matters. Over time, changes will need to be made to the CS&P program due to new threats, shifting requirements, updated mission/business strategies, and the need to add third-party relationships. Furthermore, it will need to adapt to new tools, technologies, processes, procedures, staffing, hiring etc. That being said, what are the qualities that a well-resourced CS&P program or project should shoot for? In describing a healthy, mature Federal organization’s CS&P program, operations, and/or systems, Criterion starts with the most basic elements of the program mission/business: Identify, Protect, Detect, Respond, and Recover, along with general programmatic, external connections, and training/career aspects. Our customized and tailorable approach enables Federal D&As to determine activities that are important to their critical service delivery and applicable CS&P goals and objectives, and then prioritize investments to maximize the impact of each dollar spent. In an optimized, high maturity state, policies, procedures, and strategy are fully institutionalized, repeatable, self-generating, consistently implemented, and regularly updated based on a changing threat and technology landscape and mission/business needs. Criterion’s model, processes, and toolsets can help organizations create the roadmap they need to improve the maturity of their CS&P programs, moving towards this optimized state.